With Northland’s Mark Lee (12) defending, Liberty’s Mitchell Okuley passes to an open teammate during the first half of Friday’s Division I district tournament game in Powell. 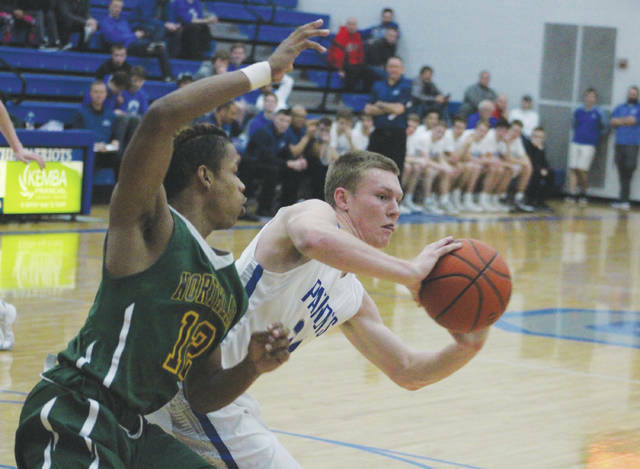 The Olentangy Liberty boys basketball team used the three ball to stay close early, but Northland closed the first half on a 7-0 run and parlayed its 27-19 halftime edge into a 56-44 win in the second round of the Division I District Tournament Friday in Powell. Mitchell Okuley connected on three-pointers on back-to-back possessions to cut a pair of four-point deficits down to one, and a Nick Nakasian triple made it an 18-17 game with just under three minutes left in the half. But, the 23rd-seeded Vikings didn’t flinch. JeJuan Weatherspoon hit a three of his own to balloon the lead back to four and William Mfum scored a pair of hoops — the first a dunk and the second a buzzer-beating jumper from the foul line — to give Northland its eight-point halftime lead. The 23rd-seeded Vikings outscored the 14th-seeded Patriots 13-9 in the third quarter and the teams played an even fourth, 16-16, to account for the final margin. Nakasian led Liberty with 17 points while Weatherspoon and Mfum had 17 apiece for Northland. The Braves poured in 35 fourth-quarter points, getting as close as five in the fourth quarter, but couldn’t quite get over the hump in Friday’s Division I District Tournament game in Chillicothe. The game was tight early, with the 17th-seeded Cavaliers clinging to a 14-13 lead after eight minutes of action. Things got away from 19th-seeded Olentangy a bit in the middle two quarters, though, as Chillicothe used a 23-13 second and 20-16 third to build a bit of a cushion. The Braves’ Sean Marks, fresh off setting the team’s single-season scoring record, finished with a game-best 31 points in the loss. Jerred Kinnaird was also solid, finishing with 14 points, while Alex Sieve and Austin Brown closed with respective totals of 12 and 10. Brandon Maughmer led the Cavs with 26 points, most coming in the paint. The 13th-seeded Pioneers were right in the thick of things early, but a 12-0 second-quarter spurt shifted the momentum firmly on the side of the 12th-seeded Chieftains, who won all four quarters en route to a 17-point win in the second round of the Division I District Tournament Friday in Logan. Matt McCollum scored a team-best 13 points for Orange while Bryson Lane and Luke Ballinger, who combined for three of the team’s six three-pointers, finished with 10 apiece. Bo Myers scored a game-high 24 points to lead Logan while Caiden Landis and Coby Bell added 17 and 13, respectively.